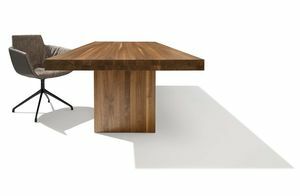 Versatile and functional solid wood furniture for your dining room. With our tables, chairs, benches, sideboards and display cases, you can turn your dining room into a place for enjoyment. You choose the ingredients: A wide range of table designs can be paired with different chairs and benches in any way you wish. Innovative table extensions bring flexibility into your day-to-day life, and ergonomically designed chairs and benches ensure first-class seating comfort. Functional occasional furniture offers both practical storage space and the perfect way to display your decorative accessories and ornaments. Start planning – exactly the way you want it to be. Bringing nature into your dining room. Our Waldkante wall cladding will fascinate with its unique surface texture, made entirely from untreated solid wood. 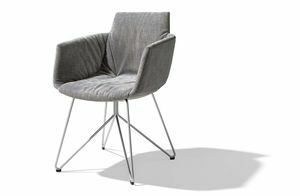 This helps provide a healthy and comfortable environment in your dining room - while also creating a whole new look. Waldkante wall cladding can, for example, give a beautiful sense of unity with other furniture in the same type of wood, or provide an exciting contrast with elegant coloured glass or metal surfaces.